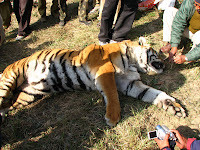 One more tiger has been reported dead from the core area (Gojera nullah, Kanda beat, Dhikala range) of Corbett Tiger Reserve on January 12, 2010. It was a 5-6 yr old male in its prime. Senior forest department officials have said that the cause of death can be ascertained accurately only after the post-mortem report. However, as the circumstances around pointed to, the death could be due to poisoning. It seems the tiger had fed on a dead cow, the carcass of which could have been poisoned. The matter is being further investigated by the forest department.Four tigers (3 males & 1 female) dead in a span of one month in Corbett Tiger Reserve, supposed to be one of the best managed tiger reserves of the country. Though the female and one male died due to old age and infighting, respectively, the cause of death of two other males is yet to be ascertained, and is suspected to be not natural. Not just in Corbett, but tigers have died in mysterious conditions in other well-known tiger reserves in Indial in recent past. Tigers do occasionally stray out of the protected forests to fringe areas that are not notified sanctuaries, national parks or tiger reserves. We don't even know the status of those tigers that have strayed out to such areas. Shrinking habitats, dwindling prey base and ever-increasing cattle populations in and around forests, bring tigers in confrontation with people. Between 2005 and 2008, at least 20 tigers have been poisoned to death and 10 died in accidents in India. In 2009, 66 tiger deaths have been officially reported. With only 1400-odd tigers remaining in the wild as per the Government of India estimates in 2008, do you think that tigers are really safe in India?